Today's interview is with self-help author Tony Palermo. We're talking about his book "Positive Thoughts Will Change your Life | A Handbook For Personal Transformation." My name is Tony Palermo and I’m a certified life coach based in California. I’m 38 years old and grew up in northern California. I went to Butte College to get a few two-year degrees and went on to get my four-year degree at California Southern University down in Costa Masa near the Los Angeles. 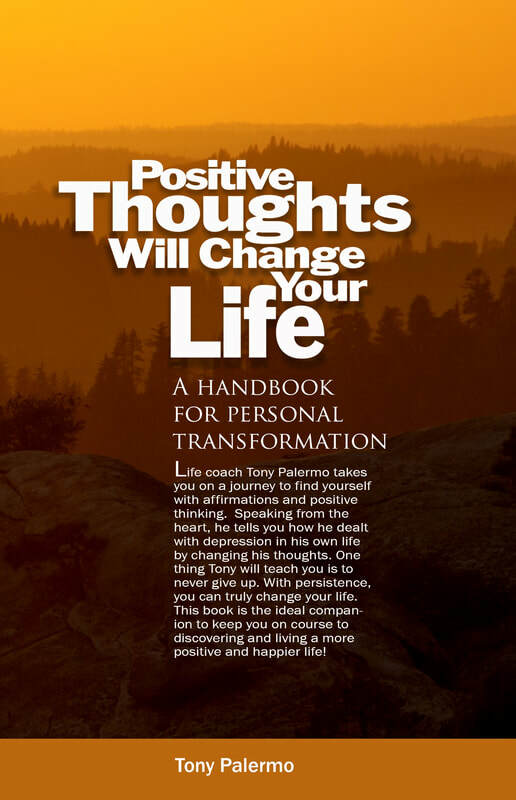 Describe your book, “Positive Thoughts Will Change Your Life,” in a few sentences. Was helping others address problems in their lives and accomplish their goals something you were always interested in? Or is it a passion that evolved over time? The passion really has evolved over time. For a long time I suffered from being low and depression it was not until I found my life coach that I really turned a corner and started to get some real help for it. At that time I thought to myself I would love to help people and spread the word about affirmations and thinking in a positive way to change people’s lives. In a way getting help with my depression changed my life in a lot of ways. Not only was I happier but I wanted to help other people with not only depression but with anything they had issues with. You write a lot about the power of changing one’s negative thought processes. For many people this seems very daunting. Is it as challenging as it seems or is something that gets easier with the right approach? Let me say this does not happen overnight. I still catch myself thinking in a negative way at times and in turn will start to feel depressed. But now I realize if I change my thinking to be more positive I can change the way I feel. It does not take long now because I have been thinking in a positive way for a few years now. People will give up because they see no results. I totally understand this it took me a few months of saying positive affirmations before I started to see change. But with that said in the end it’s worth it. You can do it, just don’t give up. You’ve written about dealing with break-ups in a healthy way. What are some of the biggest mistakes people make when trying to deal with the end of a relationship? In my experience, people tend to try and hang onto the past. They will try to get back together with their ex even if they know deep down they are not the right person. People will often want to get back together because they are afraid of being alone. Being alone sometimes is a good thing. It gives us time to heal and look back on our relationship and understand why it did not work. My main point is like the old saying goes it’s better to be single than in a bad relationship. Don’t try and get back together with an ex just because it’s scary being along or you don’t want to be alone. In addition to writing, you do both personal and business life coaching. A lot of people have some level of familiarity with personal life coaching, but business life coaching is a little more foreign to most people. What can life coaching do for someone in the business world? In the business world, I help owners and executives with a wide range of issues. First a lot of people who run companies not all but a lot have a lot of self-doubts that they are not doing a great job. Or they just don’t feel good about what they are doing. I help them to realize that self-doubts and thinking in a negative way can impact their business. It’s really almost the same as turning negative affirmations to positive affirmations, even owners or top executives have self-esteem and self-doubts about their business lives and personal lives. No matter if it’s personal life coaching or business life coaching the main thing I’m trying to get the client to realize is they can feel good, they can feel happy, they can feel wonderful about their life.